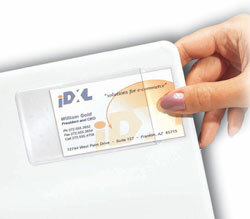 Available in a side loading design, the PVC-free business card holder has the ability to personalize catalogs or handouts provided to customers by storing contact information directly on it. Create more professional-looking proposals and reports. Attach your business cards to proposals, presentations and reports without staples or paper clips. Use this versatile product to identify ownership of software or policy manuals and reference books. It's as simple as attaching the holder and inserting a business card. Peel and Stick. Side Load. 10/PK.